Although Matt Hughes, a spotter on the Discovery series Storm Chasers, died on May 26th, many fans only found out this week when told he suffered "a fatal injury at home." Today, we've learned it was from a suicide attempt. The death of storm-chaser Matt Hughes was today at the center of intense speculation. Many fans only found out the 30-year-old presenter had passed away at the end of Wednesday's episode of the Discovery series in which he starred. Hughes, who has a wife Kenda and two sons Collin and Hunter, actually died on May 26. He was not killed in the course of chasing storms — an obsession he pursued for 15 years — but after suffering a fatal injury at his home. There were today reports that Hughes's death was due to complications from a failed attempt to kill himself. Aaron Blaser, a meterologist who had worked with Hughes for many years, claimed he had tried to kill himself on May 14. "One of our KAKEland StormChasers, Matt Hughes, was taken to the hospital after trying to take his life. This sentence is still hard to explain and even more difficult to express on a computer screen. Matt was in the hospital for several days in intensive care, there was a 24 hour vigil outside the waiting room, family, other chasers, business associates, etc." The presenter began working on the hit show as a spotter for veteran Sean Casey. 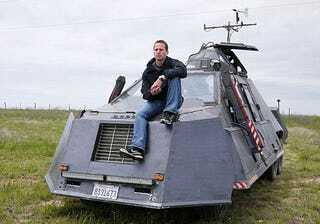 He pioneered tracking storms in the 'Doghouse' vehicle and Casey was then able to intercept them in his purpose-built TIV-3 shown above. We met Casey and his TIV-2 at SEMA two years ago. Read more about that here.